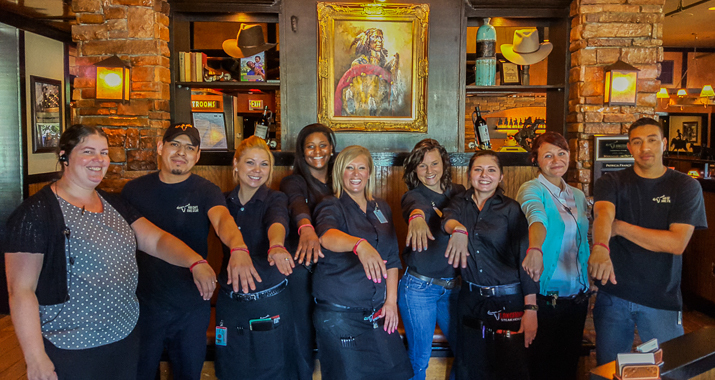 From left, Managing Partner Patricia France and team members Victor Tavares, Jessica Taubr, Gabriella Howell, Tiffany Loving, Hali Brittian, Melanie Crowder, Crystal Drought and Edy Castillo model their Darden Dimes wristbands. Managing Partner Patricia France doesn’t mind talking about the accident. In fact, she tells every team member who joins her at LongHorn Steakhouse about it. That reminder that they, too, might need help someday propelled her team to 100 percent participation in Darden Dimes, an employee-funded program designed to provide financial assistance to team members facing emergency and catastrophic situations. Three years ago, when she was a culinary manager in Cornelia, GA, her fiancé, Joshua Cousins, was badly burned after he tripped and fell into a campfire. He spent six weeks in the Joseph M. Still Burn Center in Augusta with third-degree burns on his back, and she needed to be by his side for the first two weeks. He fully recovered, and the couple are now back to enjoying their favorite pastime, hiking and backpacking. “We love to camp and hike and were concerned that he’d never be able to wear a backpack again, but he can, and there’s no discomfort.” They recently backpacked in the Cohutta Mountains in north Georgia, a favorite spot of theirs. So far this year, Darden Dimes has helped employees and their families with 1,355 grants totaling about $800,000.